Backblaze is the easiest online backup service. It's secure and offsite. And? It doesn't make you pick & choose folders and file types to backup because it backs up all your data* on your Windows PC or Mac. And if you have an external hard drive connected to your computer at the time of backup, it backs that up too. Worried about all your research & photos? 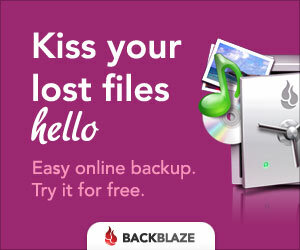 With Backblaze and its unlimited backup service of your computer and connected external hard drive, there's no need to worry. There's just peace of mind knowing that every document, every photo, every video or audio interview with loved ones, and every family story is completely backed up [Not to mention everything else on your computer and connected external hard drive.] so that one day your descendants can read what you found and wrote about your ancestors. Stop worrying about what you can afford to backup, and backup everything with Backblaze. What are you waiting for? To lose everything? Why? Why should you try Backblaze? No matter the plan you choose, you get unlimited backup of everything for cheaper than an Ancestry.com subscription. Not bad for research peace of mind and your family's legacy.